In my previous post about Shakespeare’s Beehive, the book in which antiquarian booksellers George Koppelman and Daniel Wechsler argue that they have found a dictionary owned and annotated by Shakespeare, I focused on some of the problems with the assumptions that underlie their arguments. In this post, I will examine the evidence that they present. Their evidence is made up of correspondences or verbal parallels they see between the annotations and Shakespeare’s works. Many of these rely on what they call mute annotations: underlinings, slashes by major entries, circles by subsidiary entries. This is problematic for several reasons. For one thing, they can pick out any word or words from a flagged entry (whether underlined or not) to match with a passage in Shakespeare. Sometimes they pick words scattered in various distantly separated parts of the Alvearie that appear close together in Shakespeare. 2) Rare and peculiar words. How many of the words underlined or added in the margins of this copy of the Alvearie are used by Shakespeare and Shakespeare alone, as opposed to other early modern writers? Further, how many of the words that are not marked or underlined in this copy of Baret are nevertheless present in Shakespeare’s works? Are these proportions different, and to what degree? 3) Associations. K[oppelman] & W[echsler] write of “textual proximity in Baret mirroring textual proximity in Shakespeare” (107). As we know from studies of other resources used by early modern writers, it is in the nature of a dictionary to list commonly associated words (including synonyms and words that co-occur in proverbs or adages). How likely is it that Baret’s Alvearie–as opposed to proverbial wisdom and common association–is the only possible source for Shakespearean associations? Again, following the line of questioning above, how often do spatially proximate combinations of words that are not underlined in Baret nevertheless co-occur in Shakespeare’s works? How often do the proximate marked words in Baret occur near one another in writers other than Shakespeare? Until the necessary statistical analysis is performed, we can only assess the strength of the parallels Koppelman and Wechsler offer as evidence. They are weak. Incredibly weak. So weak that many do not deserve to be called verbal parallels at all. 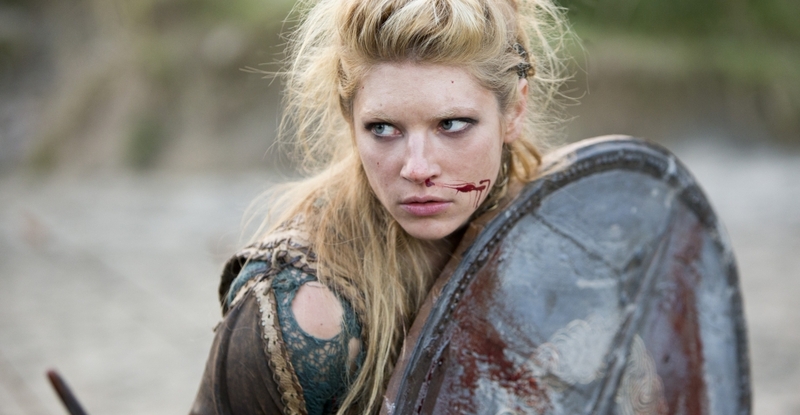 And some of the parallels are indeed closer to writers other than Shakespeare. For instance, by “cawdle” (caudle, a spiced gruel mixed with wine or ale and used medicinally), the annotator adds, “a cawdle vide felon.” Under “felon,” Baret includes a figurative use of caudle: “with a cawdle of hempseede chopt halter wise, and so at the least to vomit them out, to cut them off from the quiet societie of Citizens, or honest Christians” (“cawdle” is underlined by the annotator). The annotator also adds a cross reference under “hemp:” “hempseed chopt halter vide felon.” Koppelman and Wechsler admit that Shakespeare never uses “felon” and “caudle” together, but note that Jack Cade uses both words in Act 4 of 2 Henry VI. In the second speech, Cade says, “Ye shall haue a hempen Caudle* then, & the help of a hatchet” (4.7.88, quoted from First Folio, which mistakenly prints “Candle”). Koppelman and Wechsler quote the main definition of “caudle” from the Oxford English Dictionary (OED); however, they don’t note that definition b. specifically refers to a caudle made of hemp. Two passages are quoted, Cade’s speech and a passage from the Martin Marprelate tracts of 1588: “He hath prooued you to have deserued a cawdell of Hempseed, and a playster of neckweed.” This wording is closer to Baret than is Shakespeare’s, and it is earlier. Did the tract author own this copy of the Alvearie? I have no reason to think that he did. Did Shakespeare borrow from Baret or Marprelate? 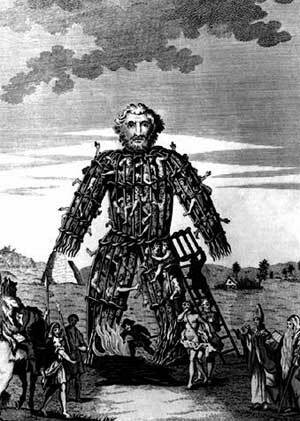 Or was a hempen caudle a well-known idea? This supposed verbal parallel is actually stronger than many of the ones Koppelman and Wechsler note, and it more closely resembles someone else’s writing. This does seem like an unusual phrase, and the exact wording does appear in both Shakespeare and Baret, although the annotator only underlines the first word. However, the phrase was not unusual in the Renaissance. In the OED, definition 3a under “wedge” reads: “An ingot of gold, silver, etc.? 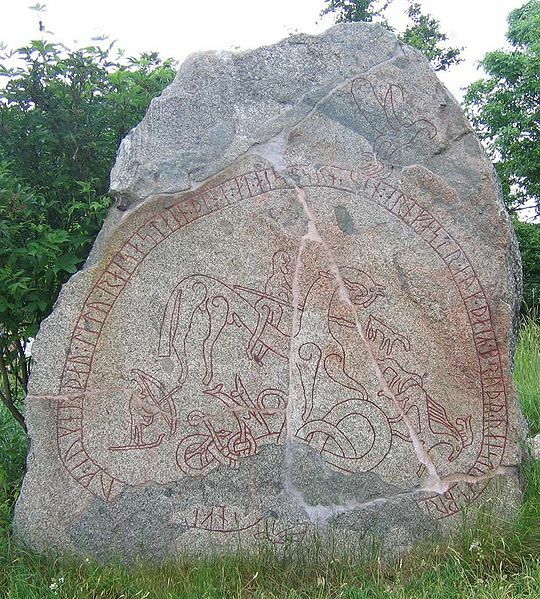 Obs.” “Wedge” was first used to mean an ingot of metal in the Old English period. The phrase also appears in some early modern translations of the bible. In the Coverdale Bible (1535) and the Great Bible (1539), Job 28:16 contains the phrase, “No wedges of gold of Ophir,” while Joshua 7:21 of the Geneva Bible (1560) includes the phrase, “Two hundredth shekels of siluer and a wedge of gold of fyftie shekels weight.” Considering how common the phrase was, it seems rash to assume Shakespeare found the phrase in Baret. The same is true of “yield the ghost,” uttered a few lines later, again by Clarence. This phrase is “printed in Baret with a simple slash and variant spelling addition provided by the annotator.” This again is quite a common phrase, a variant of “give up the ghost.” The earliest quotation in the OED comes from the late 13th-century South English Legendary. It is also used in the last verse of Genesis (49:33) in the King James Bible. In discussing Hamlet, Koppelman and Wechsler say, “Baret receives a citation in many critical editions of Hamlet for the peculiar use of ‘stithy. '” To indicate the “many” critical editions that refer to Baret, they cite one edition from 1819 (Thomas Caldecott, ed., Hamlet and As You Like It: A Specimen of a New Edition of Shakespeare, London: John Murray). They fail to explain what is “peculiar” about Shakespeare’s use of the word. Although it may be unfamiliar to many people today, it was common enough in Shakespeare’s day. Shakespeare’s use is slightly unusual in that he uses it to mean forge or smithy rather than an anvil. The OED includes only five quotations for this usage. Shakespeare’s is the earliest. Baret, however, defines “stithy” as “anvil.” The annotator adds “enclume,” French for anvil. In other words, if Shakespeare’s use of the word is peculiar, he did not get that association from Baret, and the annotator didn’t record the meaning Shakespeare uses. This might be significant if Baret or the annotator mirrored Shakespeare’s unusual use of the word, but they don’t: neither uses it as a verb, and neither uses it figuratively. Instead, Baret uses and the annotator underlines a rather ordinary word used in a rather ordinary way (and cudgel, though it has a long history, was not “archaic” in Shakespeare’s day). In their discussion of the sonnets, Koppelman and Wechsler mention what they think “may elicit the biggest ‘wow’ of all.” The annotator has marked the following entry with a circle: “Let, impediment: hinderaunce.” No words are underlined. We are supposed to be amazed by the similarity to the opening of Sonnet 116: “Let me not to the marriage of true minds / Admit impediments….” The problem is, of course, that Shakespeare’s “let” and Baret’s “let” have quite different meanings and functions. Baret’s “let” is a noun. It means impediment. He is defining it as an impediment. The OED defines it in a similar manner. Shakespeare uses the verb, meaning “to allow.” When Shakespeare was composing his sonnet, did he perhaps consider the other meaning of “let”? Was he playing with that meaning? I don’t know. It’s possible, but if he did, there is no reason to think he took the association from Baret. The two words are synonyms. Shakespeare didn’t have to read Baret to know that. Koppelman and Wechsler believe that the best evidence that Shakespeare was the annotator comes from the trailing blank, a blank page at the end of the book on which the annotator has written extensively, mostly English words with French equivalents. They believe this page relates to the Falstaff plays (1 & 2 Henry IV, Merry Wives of Windsor and Henry V, in which Falstaff’s death is announced and in which Shakespeare includes a significant amount of rudimentary French). They claim that almost all of the (English) words appear in one of these three plays. Not all appear exactly, however. For instance, the annotator has included “pallecotte,” which he defines as “habillement de femme.” Shakespeare does not use the word “pallecotte,” but he does use “coat” and “woman’s gown.” These do not seem extraordinary matches. There is one phrase that is a truly extraordinary match to something Shakespeare-adjacent. The annotator writes “A lowse un pou lou lou.” This exact phrase appears in an 1827 French translation of Merry Wives.” That is an interesting coincidence, but Koppelman and Wechsler see great significance in it. I don’t understand how a French translator working long after the deaths of Shakespeare and the annotator can have any bearing on the relationship between the two. According to the OED, the etymology of “bucket” is uncertain, but it apparently comes from “Old French buket washing tub, milk-pail (Godefroy s.v. buquet).” The Online Etymology Dictionary says “bucket” comes from Anglo-Norman “buquet.” In other words, I suspect this is an English word with its French equivalent. Such word pairings make up the bulk of the page. Koppelman and Wechsler have transformed a glossary-style entry into a bilingual compound word with strong Shakespearean associations. This seems a particularly egregious example of confirmation bias. They concluded long ago that Shakespeare was the annotator, and then they settled down to find evidence. This is not the way one discovers the truth. It is, I suppose, possible that Shakespeare is the annotator, but until a rigorous analysis (including statistical analysis) is done of the text, all we can say is that Koppelman and Wechsler have provided very weak evidence for their hypothesis. George Koppelman and Daniel Wechsler. 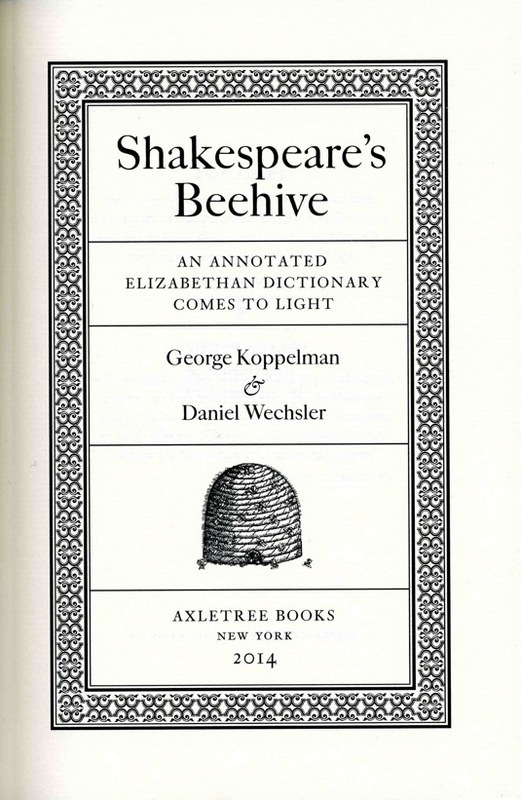 Shakepeare’s Beehive: An Annotated Elizabethan Dictionary Comes to Light. New York: Axeltree Books, 2014. Kindle ed. Last week, Shakespeare fans celebrated the Bard’s 450th birthday, and two New York antiquarian booksellers announced that they had discovered a copy of an Elizabethan dictionary annotated by the birthday boy. In 2008, George Koppelman and Daniel Wechsler purchased a copy of the second edition of John Baret’s Alvearie, or Quadruple Dictionarie, containing four sundrie tongues: namelie English, Latine, Greeke and French on Ebay for over $4000. This copy was annotated in what Koppelman and Wechsler believe is a late Elizabethan or early Jacobean hand. Over the years, several scholars, particularly T. W. Baldwin (in William Shakespeare’s Small Latine and Lesse Greeke) have suggested that Shakespeare was probably familiar with and may have owned a copy of Baret’s Alvearie*, along with Thomas Cooper’s Thesaurus. Koppelman and Wechsler go one step farther: they believe Shakespeare owned their copy of the Alvearie and that the annotations are in his hand. If this were true, the volume would be of immeasurable value to Shakespeare scholars; in a more literal, monetary sense, it would also be of immeasurable value to Koppelman and Wechsler. Baret defines each word or phrase in English, then provides the equivalents in Latin, French and Greek. He also includes quotations and aphorisms in all languages. The annotator has added two types of annotations. Koppelman and Wechsler call the first type “mute” and the second “spoken.” The mute annotations include underlined words and phrases, slash marks by major headwords, circles by subsidiary headwords, and other marks. The spoken annotations are additions: words and phrases as cross-references to other entries, corrections, or additional quotations and aphorisms, including biblical quotations in English. 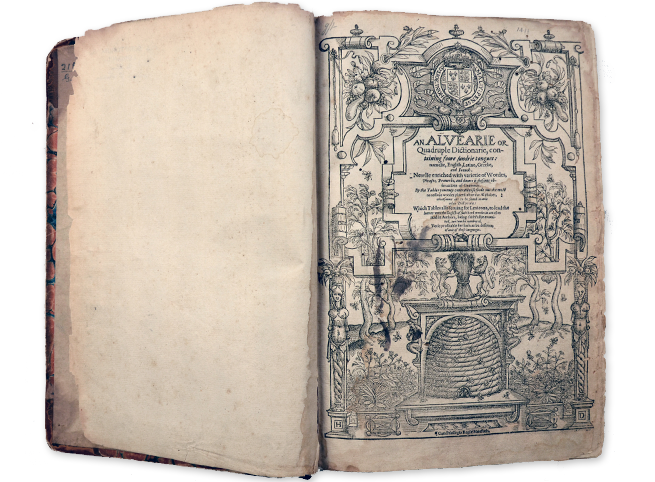 On their website, shakespearesbeehive.com (free registration required), Koppelman and Wechsler have provided a zoomable digitized copy of the Alvearie, as well as a compilation of all the annotations. Regardless of the identity of the annotator, this is of huge value to scholars. A complete digitized copy is useful in itself, and the annotations provide valuable insights about how such a dictionary was used in the Early Modern period. Why do Koppelman believe the annotator was Shakespeare, and how strong is their evidence? They present their case in their newly published book, also called Shakespeare’s Beehive, which they present as an (extremely) extended catalog description of the their copy of Baret. Although I wrote my MA thesis on The Tempest, and Shakespeare was a test area on my Ph.D. written and oral exams, Shakespeare and Renaissance literature are not my primary areas of study. I am not an expert on paleography or textual studies. However, I know enough to be profoundly skeptical of Koppelman and Wechsler’s argument and deeply unimpressed by their evidence. 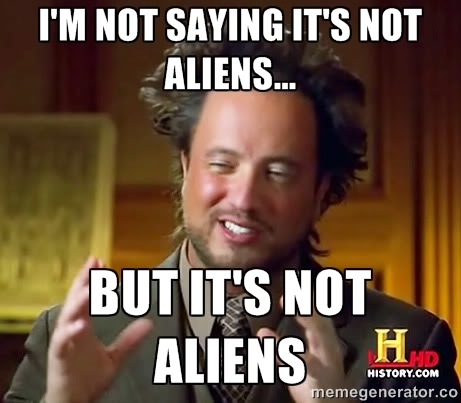 Even before examining the evidence in detail, I noticed some red flags that caused me to question their methodology. In their introductory chapters, they are extremely defensive about arguments that no one, as far as I know, has actually made. Of course, when mounting an argument, it is necessary to anticipate possible objections, but Koppelman and Wechsler’s arguments have a strong whiff of straw about them. For two booksellers in Manhattan to purchase, out of the blue, a heavily annotated book from the library of all libraries, on Ebay… it’s understandable that no one would give that a chance. Much the same thing is said by proponents of Bigfoot, Young Earth Creationism, psychics, Reiki, or any other fringe belief. Why don’t experts in the relevant field back the fringe-proponent up? Because they wouldn’t get tenure, they wouldn’t get published, they’d be mocked and ostracized, they’re in on it, they’re pawns of Big Whatever, they’re closed-minded, they don’t pay attention to amateurs. But who are these scholars who won’t support Koppelman and Wechsler? They don’t say. In general, they have gotten sympathetic coverage, and scholars have been cautious but not dismissive. Stephen Greenblatt is quoted in the Sydney Morning Herald as saying, “It would reinforce, in a fascinating way, Shakespeare’s passion for language. We know that Shakespeare had an eye out for unusual words – but we have only limited knowledge of where he went to find them.” He adds, however, that he has “not had time to weigh the evidence.” Shakespeare scholars would love to find a copy of absolutely anything annotated by Shakespeare. Seriously, they would be absolutely giddy with delight over the Elizabethan equivalent of “roflmao” next to a dirty joke. Even the most skeptical scholar would be thrilled to find a new piece of documentary evidence about William Shakespeare. Scholars, however, will only support the identification of Shakespeare as annotator if they feel it would be unreasonable to doubt that identification. This is a fairly high evidentiary standard, since it requires on to treat skeptically the idea that this handwriting is Shakespeare’s and to seek out counterexamples that might prove it false. This is exactly how scholars in any field should respond to an extraordinary claim. They go on to explain the research methods that will likely be used to assess Koppelman and Wechlser’s claims. These are rigorous and time-consuming, as they should be. Such a high evidentiary bar diminishes the possibility of confirmation bias and cherry picking. Koppelman and Wechsler also use straw man arguments when discussing the the handwriting of the annotator. The only universally accepted genuine examples of Shakespeare’s handwriting are six signatures on legal documents. All of the signatures are in Secretary hand. Other examples of handwriting that are sometimes attributed to Shakespeare–some other signatures, including signatures in books, and Hand D of the manuscript of the collaborative play Sir Thomas More–are also in Secretary hand. Most of the “spoken” annotations in the Alvearie (and almost all of the annotations in English) are in Italic script. As far as paleography is concerned, this is problematic, but not in the way Koppelman and Wechsler suggest. They argue at length against the suggestion that Shakespeare couldn’t possibly have been capable of writing in Italic script. They don’t, however, quote or cite anyone who has actually made this argument. The overriding question…is whether Shakespeare should forever be categorically denied an ability to use both scripts based principally on his Stratford background. Does this not seem oddly in perverse harmony with someone who argues that a provincial boy from Stratford as author is incompatible with one of the great speeches in, say, Henry V? I suppose it is possible that scholars have argued that Shakespeare couldn’t have ever used Italic script because of his humble background, but Koppelman and Wechsler provide no evidence that this is so. The association between conventional scholars and Shakespeare-deniers is particularly ironic, since Shakespeare-deniers rely, to a large extent, on confirmation bias and cherry-picked evidence. As we shall see, these are techniques at which Koppelman and Wechsler also excel. Understandably, things bend heavily, even necessarily, under the burden of proof in the quest for any namable [sic] annotator, because we live in an age where an enormous amount of trust is placed in the ability to test and prove something scientifically. In the absence of scientific proof, evidence – no matter the strength – is often deemed unreliable, regardless of how it registers in the court of public opinion. It follows, then, that an inability to precisely test ink from the Elizabethan period will make for a wobbly case in the quest for answers as to the exact age of the annotations in our Baret, let alone to the still more complicated determination of who has added the ink to the pages. I hardly know where to begin. There is the idea that “scientific proof” is somehow different from–and more definitive than–“evidence.” When a formal distinction is made between “proof” and “evidence,” mathematics and law usually get custody of “proof.” Scientific conclusions–no matter the strength of the evidence–are always provisional. In addition, why would anyone expect “scientific proof” when the relevant field is not a science? One could certainly make the case that the methods and evidence used in the Humanities are often unfairly denigrated in comparison to those used in the sciences, but that is not the issue here. Scientific testing of the ink would only be relevant if the annotations were suspected forgeries. Again, this does not seem to be the case. Even so, scientific testing would be of limited value–it could show a forger used ink not available during the Renaissance, but precise dating of the ink would be much trickier. There are many non-scientific methods for dating texts, manuscripts, literary works, and handwriting. They have been around for ages and have become refined over time. They do not rely on scientific testing. They are not always 100% reliable, but they work fairly well. 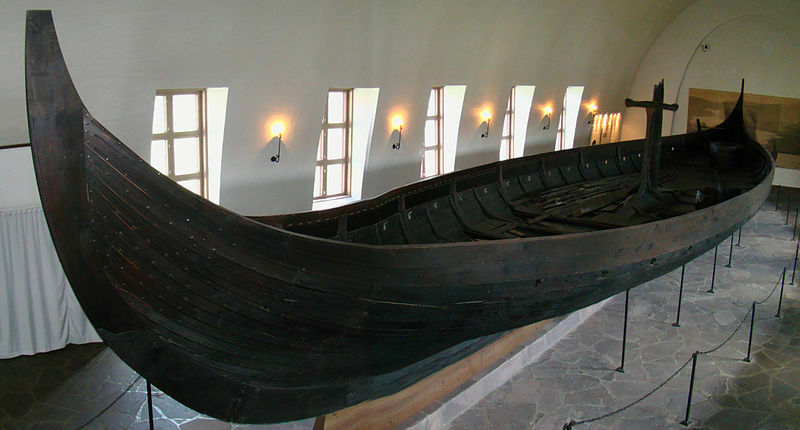 In some cases they can provide a narrower date than C14 dating, and they are less destructive. Again, this focus on science is a straw man. The real issue is the difficulty of comparing Shakespeare’s hand to the annotator’s hand. Because of the different scripts, the comparison may be impossible. More accurately, it may be possible to say with a degree of certainty that Shakespeare did not write the annotations, but the chances are vanishingly small that an examination of the writing will suggest the likelihood that Shakespeare is the annotator. Let’s consider why the accepted signatures are accepted: they are on official legal documents. That’s pretty much it. It’s the nature of the documents that assures authenticity. They form a pathetically small and poor sample for handwriting comparison. No other alleged example of Shakespeare’s handwriting has been accepted based on a comparison with the signatures. Let us look for a moment at Hand D in Sir Thomas More. 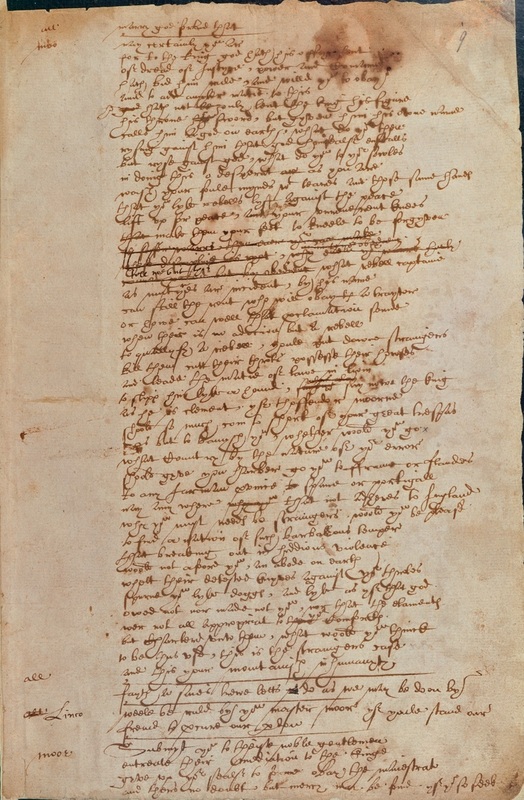 For many years, many scholars have suggested that this handwritten passage is the work of Shakespeare: that it matches his style and some of his idiosyncratic spellings, and that it is consistent with his handwriting. The corrections suggest that it is an authorial hand: if Shakespeare is the author, it is his hand; if it is his hand, Shakespeare is the author. Hand D has been studied and studied and studied. It has been subjected to two computational stylometric studies (that’s sciencey). One, by Hugh Craig and Arthur Kinney, concluded that it was the work of Shakespeare; the other, by Ward E. Elliott and Robert J. Valenza of the Claremont Shakespeare Clinic, concluded that it was not. ** All that study, and the jury is still out. That’s how high the evidentiary bar is. That is how high it should be. Koppelman and Wechsler’s straw man arguments attempt to lower the bar, to trump objections that haven’t even been made yet. Bias in favor of science or against amateur booksellers doesn’t matter. Evidence matters. In my next post, we will examine the evidence. *Latin for beehive. His students, like bees, went off to find the nectar of words and then returned to him with the fruits of their labor. **For a discussion of the stylometric studies, see MacDonald P. Jackson, “Authorship and the evidence of stylometric,” in Shakespeare beyond Doubt: Evidence, Argument, Controversy, ed. Paul Edmondson and Stanley Wells. Cambridge UP, 2013.